In preparation (and as therapy for the waiting) for our girls (plus one boyfriend) arriving Christmas morning dozens of little donuts have popped out of my oven spreading Christmas cheer around paradise. Assuming all the ingredients are in my kitchen (because honestly, last Saturday they were not and I made 3 trips down the stairs past the beach and to the grocery all before noon but I was also baking cookies for which I kept forgetting something too), they take me less than half an hour to turn out. So they are ostensibly quick, but it's the softness, the taste and the cuteness that keep me experimenting. I started with chocolate with peanut butter glaze. Peanut butter is particularly American; so when I asked one of my pint-sized Australian friends which flavor she would like, she chose chocolate with chocolate glaze (with snowflake sprinkles). Then I wanted to try a little chai and almond flour riff on the Mexican wedding cake/Russian tea cake or whatever your family calls those little balls of flour, butter, sugar and nuts rolled in powdered sugar (which is icing sugar here, in case you need to decode the many sugar choices), I made a chai version. Because when you are measuring out a bunch of spices, you might as well do it twice. I am killing it on the parentheses in this post. Sorry. This is what happens when I take a big break from posting. Words just everywhere. Literally everywhere. We are one year into this fun study abroad program also known as my husband's international assignment. One year and maybe three posts? Not exactly crushing my goals for keeping this little project going. I honestly think if I had a gorgeous kitchen, I'd be posting more. But maybe not, it's hard to say. I definitely would have posted more if my MacBook didn't spend the last few months in slow decline/barely functioning/getting almost completely rebuilt (under my Apple Care warranty, phew). But maybe not, it's hard to say. And it matters little why, because I'm writing now. You need this donut recipe in your life. You also will then need a little mini donut pan. I had mini and regular-sized donut pans in the states, but did not move them. My oven here is possibly not as wide as your microwave, so it's just as well that they are in storage. I bought a cute little mini one made by Wilton here at Big W which is the general merchandise branch of Woolworth's which is a grocery chain in Australia. You need the pan. 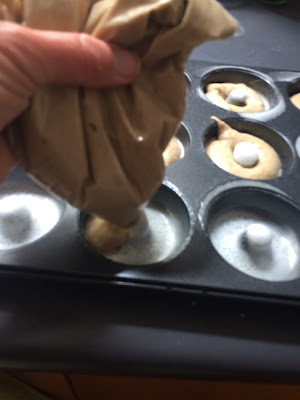 You might need a pastry bag, but I left that at home too so I use a ziploc bag with the corner cut at an angle to pipe the batter into the pan. But I have used too many ziplocs, so I'll be buying a new pastry bag (saving the planet, as you do). You also need buttermilk. You may not regularly buy buttermilk, but it makes lovely moist baked goods, is tangy and light in smashed/mashed potatoes and makes a great marinade with onion, garlic and spices for chicken. I'm a big fan. Buy a small carton and mind the expiration date. In the states, buttermilk is usually labled lowfat (good for a lot of reasons) and usually has a long life in the refrigerator. Neither is a given here so I always buy the little carton and sometimes that means I have to run to the store one more time. But the game changer here is the browned butter. The nutty, caramel taste of the browned butter has radically improved these little baked donuts. So much so that I baked a peanut butter snack cake last week just to see if substituting browned butter for the canola oil would be as good as it sounds like it would (it was). Heat your butter in a small saucepan over medium low heat and keep an eye on it, maybe stir it but maybe not. Just as soon as it starts to brown (you will see small flecks of brown in the otherwise golden butter), remove it from the heat. You can miss the golden brown, toasty flavor stage and careen towards an undesirable burnt appearance and taste pretty quickly. It's not hard, I'm just telling you not to multitask away from the stove while you are browning the butter. I'm making the assumption you have kitchen/housework ADD like me and can't simply stand at the stove and watch the butter brown with out some pain. Put on some good music and stand there, well you can dance while you wait you don't just have to stand there for the 2-4 minutes this might take. I have made these donuts so many times recently, I have the recipe all straight in my head. It's baking so you actually have to measure correctly. Cooking for me now rarely means a recipe or measuring, but baking demands precision. I don't even double baking recipes very often. I generally question the results if I were to exactly double the spices or double the leavening. I'd rather make two batches and have them much more likely to turn out as expected. 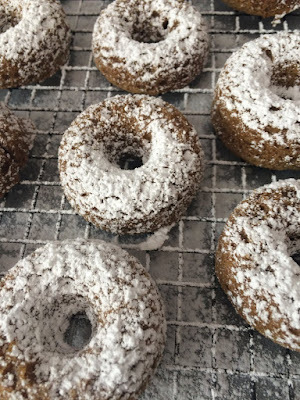 As a little bonus here, keep scrolling through for Chai Spiced Buttermilk Baked Mini Donuts since the only process pictures I have are from that little experiment. You would be wondering why my chocolate donuts are so blonde. One little aside here on being blonde in Manly: there are so many lovely Swedish students and expat families here. 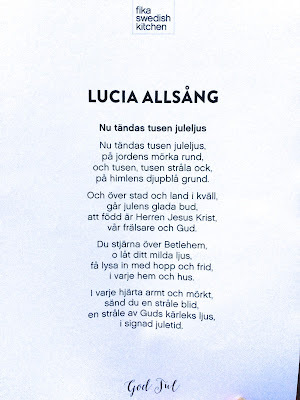 As they do, on the 13th of December the Swedish cafe here hosted their Lucia celebration. Had to go. 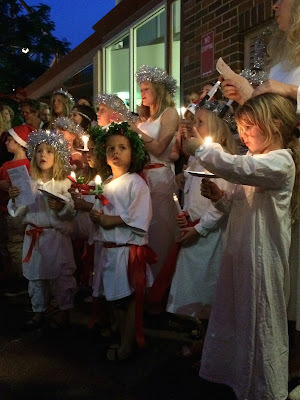 I've read of St. Lucia and heard the carol they sing as the young girls in white dresses with red ribbons wear the crowns of candles on their pretty heads. 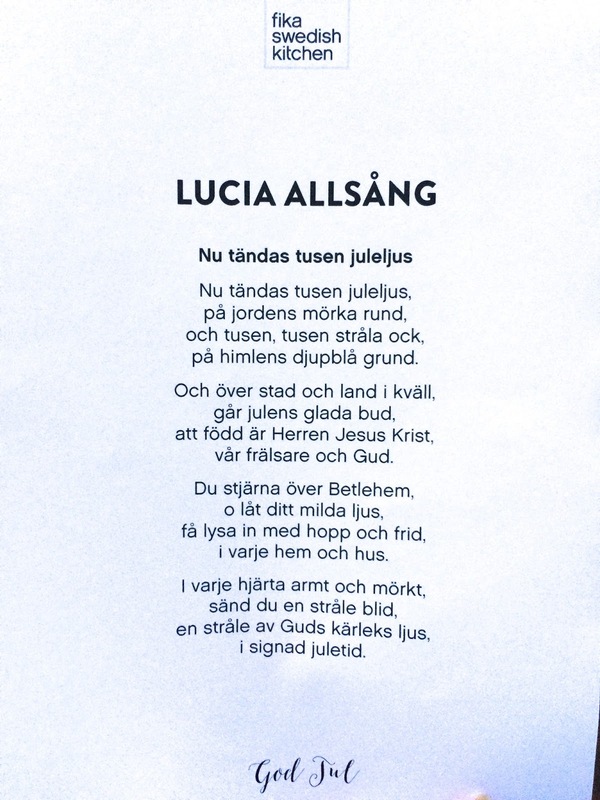 One girl was passing out the lyric sheets before the procession and spoke to me in Swedish as she handed one to me. Not Swedish, just blonde. But thank you just the same. Preheat the oven to 325 F (160 C). Spray the cups of a mini donut pan with nonstick cooking spray and set aside. In a medium mixing bowl, whisk together the dry ingredients (flour through salt). 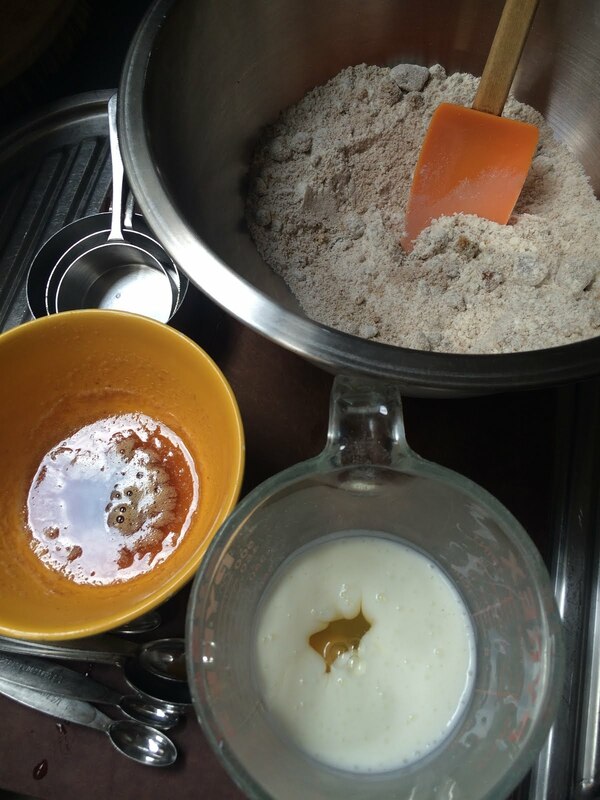 If you have one, use a 2-cup liquid measuring cup to measure out the buttermilk then whisk in the egg and the vanilla. Pour the liquids into the dry ingredients and whisk to begin to combine then add the browned butter to combine thoroughly. Here's really the only tricky part: however you manage it best scrape the batter into a quart ziplock bag or a pastry bag. I use my silicone spatula, but if you had a helper it would be easier for someone to hold open the bag while you scrape. Alternately, you could scoop out the batter. But work in a timely manner, once you have combined wet and dry ingredients you need to get them baking to maximize the rise and keep the finished donut light. It's not a race, I almost hesitate to put that in there, but keep moving. You can have donuts start to finish in 30 minutes. Pipe the batter in cute little circles in the prepared pan. This is super easy until the last 3 or so when the batter level gets low. No worries, just scrape it in there and make sure the wells are equally full. You can move the batter around a bit with a knife or spoon. Pop them in the oven for 8 minutes. If they smell done at 7 minutes, go check them. If the batter has begun to pull away from the sides and the donut springs back to a light touch, they are done. With hot pads, flip them onto a wire rack to cool. Or just eat them now because warm donuts are delicious. Sprinkle the cooled donuts with powdered sugar or ice them with the following glazes. Glaze or sugar the donuts with the bottom side up (nice and rounded side which looks very donut-like). 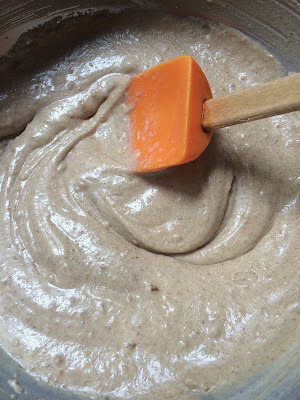 In a medium bowl, whisk together the powdered sugar, peanut butter, salt, 2 T of the milk and the vanilla until smooth. If mixture is too thick, thin with another T of the milk. Dip donuts in the glaze or make the glaze a bit thicker so you can spread it on the cooled donuts with a knife or spreader. Sprinkle on sprinkles, if desired. 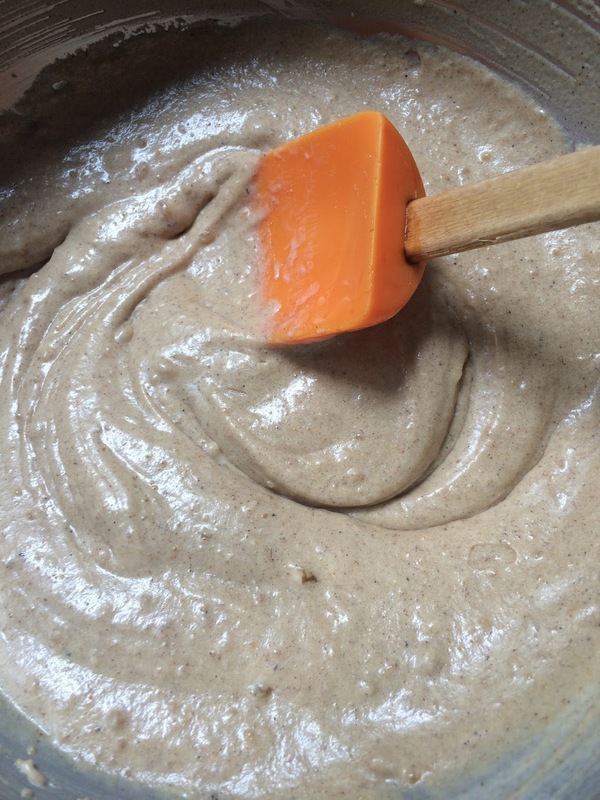 In a medium bowl, whisk together the sugar, cocoa, pinch salt, 2 T milk and the vanilla until smooth. Whisk in another T of milk if needed to thin. Dip donuts to glaze or make the glaze a bit thicker to spread on the cooled donuts with a knife or spreader. Sprinkle on sprinkles, if desired. 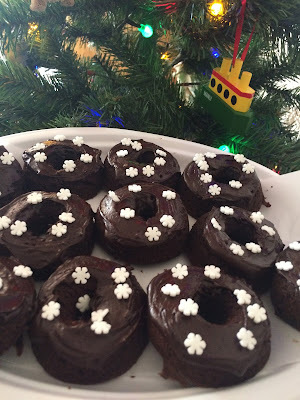 Follow directions above for Chocolate Buttermilk Baked Mini Donuts whisking together dry ingredients, whisking together wet ingredients (buttermilk, egg, vanilla) and combining both with the slightly cooled browned butter. Pipe into prepared pans and bake at 325 F (160 C) for 8 min. Flip onto cooling rack and dust generously with powdered sugar when cooled. They would also be good with espresso glaze (whisk together 3/4 C powdered sugar, pinch salt with 2 T cooled espresso).